This is a really late post of my trip to Kubah during the Lenten break. But better late than never. I really enjoyed my time at Kubah, albeit a really short one, and the trip deserves its own post. Thank to the good roads and lack of a crowd, I managed to visit the longhouses at Benuk and Annah Rais in the morning with enough time for a quick hike at Kubah National Park. Or perhaps the short time spent at the longhouses were due more to the general lack of anything to really do except walk along the bamboo boardwalks with a goofy smile on the face and nodding to the bored residents like it was a secret code that allowed you access to their lives. I wonder how it feels to have crowds of strangers trampling on your front yard every single day of your life? Day 2 in Kuching and the threat of thunderstorms made me forgo my planned excursion to Bako National Park. The RM 230 cab hire definitely did not figure in my budget but what the heck, I might as well take in whatever experience I could. Tour groups? I’m quite allergic to them. 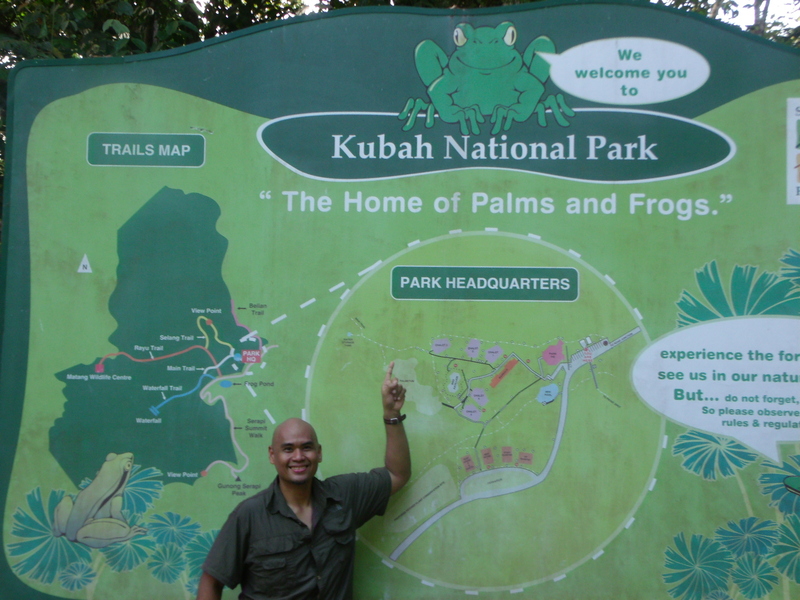 Kubah is the most accessible national park from Kuching. Unfortunately, there are no regular buses to the park so you either take a mini van, a cab, or a your own vehicle. From the main road, we followed the sign to the Matang Family Park and followed the road past it until we reached the national park entrance. The lady manning the small office was very cheerful and suggested I do a 3 hour loop to the waterfall. I opted to do the Selang trail which would take me to the viewpoint using the sealed road to the summit then hanging a right to the Rayu Trail which would later meet the Selang trail. It was a much better route she said as it would mean descending the steep parts of the Selang rather than ascending it. The 6 hour return hike on a sealed road to the summit of the mountain was out of the question as it would mean getting back down in the dark. She colored the route for me on a simple hand-drawn map and I was off to the trail after a quick stop at the comfort room. The sun was out and it was really really hot as I made my way up the steep sealed road. At times I would walk backwards just to relieve the pressure on my quads. Give me a forest trail anytime. Sealed roads are more jarring to both knees and feet not to mention the heat it gives off. It reminded my of the road up the jump-off point in Gulugod Baboy. This one was thankfully less steeper. A slowly made my way up wishing I had not listened to the lady and had taken the jungle trail instead. I went pass by a middle-aged couple who were taking photographs of a lizard on a tree by the side of the road. The road finally leveled off and I took a break at the leafy frog pond. Frogs are nocturnal animals so there wasn’t a single one croaking on the muddy pond singed by boardwalks. It was cool and quiet place to seek shelter from the heat and to catch my breath. I would have stayed longer if I had more time in the park. A few meters from the pond, I veered right to the sign post marking the start of the Rayu Trail. I was told to simply follow the color coding of the trails which were marked on the trees. Orange for Rayu and yellow for Selang. I made a conscious effort to look for the painted barks on the trees just to make sure I was on the right trail. 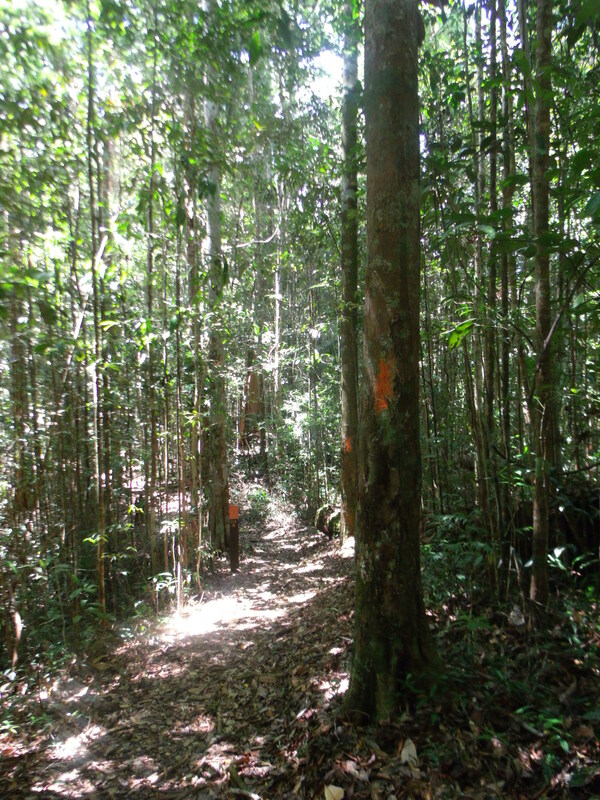 Last year, the small group I was hiking with at Taman Negara in West Malaysia had missed the trail and we had gone deeper into the jungle rather than out of it. We had not bothered to carefully look at the map nor taken heed of the color coding. I was not going to take chances this time as I was all alone and didn’t have a lot of sun time. All alone on the trail, I was dwarfed by ancient trees that soared to the sky almost blotting it out. 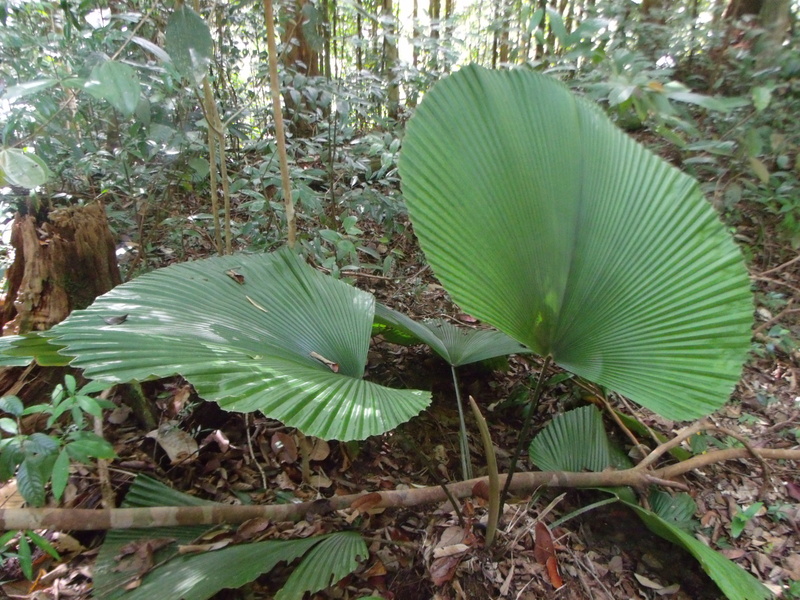 It was very cool and leafy and the only sound was that of insects buzzing. So peaceful it was on the trail, it was almost meditative. With nary an elevation and clear trail sounds, I took my time to breathe in the surroundings. There was no summit to assault and no campsite to set-up. This was a just a short hike and I was going to savor it. 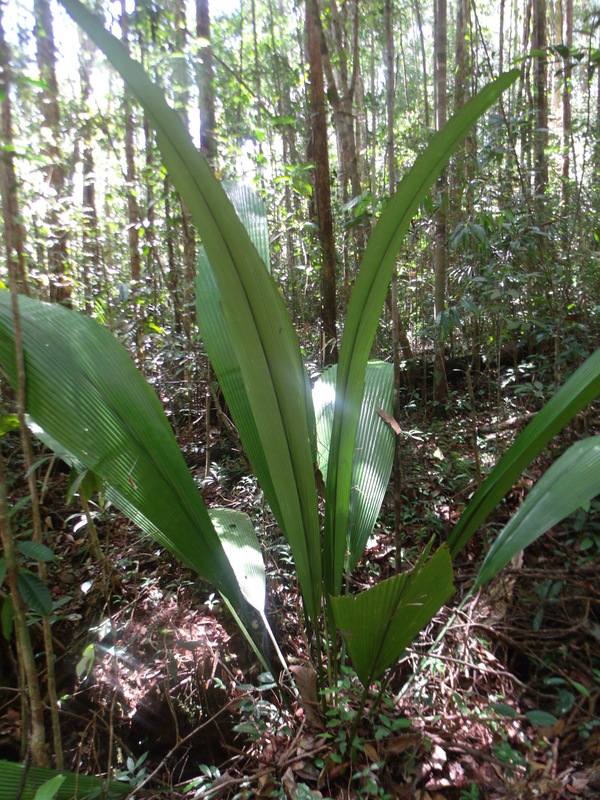 What it lacks in wildlife Kubah makes up for it in vegetation, particularly palms. There were lots and lots of wild palms and some of them were really big you can pick one off (of course I didn’t do that) and use it as an umbrella. I grew up with palms as we had several pots of them that my mom used to decorate the corners of the house with. Dead spaces suddenly came to life with these fan-like wonders. In the wild, they were even more beautiful. Like beautiful forest flowers, they stood out among the bushes and trees. 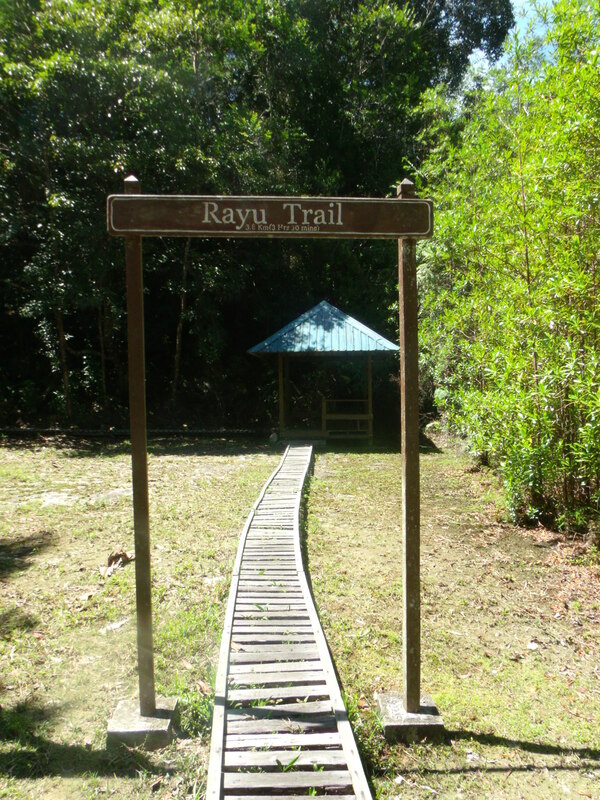 The Rayu Trail eventually linked-up with the Selang Trail which led to the viewpoint, my final destination. 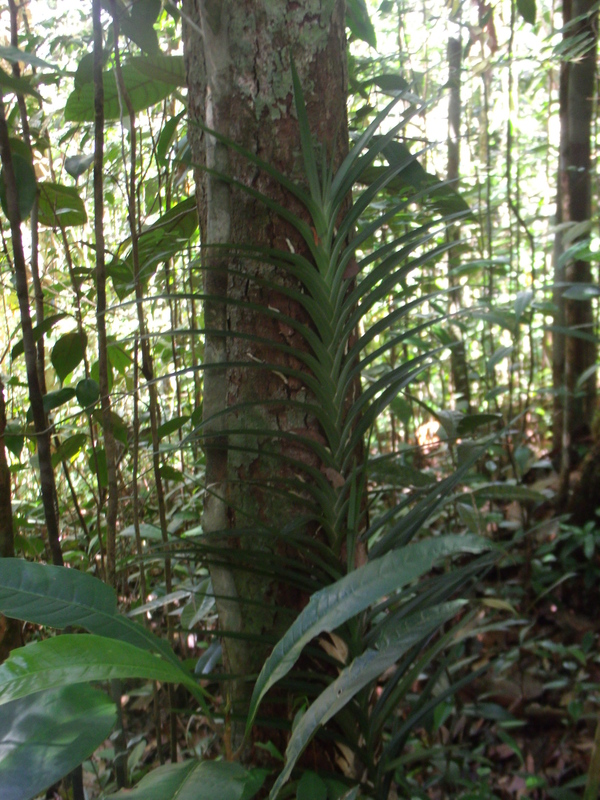 The high wooden platform was set in a small clearing and reached by a short steep ladder. The views of the valley and the small villages were magnificent. I took in the scene while snacking on the leftover kek lapis I had bought the other day. I still had not bumped on a single soul on the trail and the viewpoint and the view was all mine. I could have sat there for ever but I had to make my way back and be at the headquarters by 4pm. From the viewpoint, the trail suddenly became steeper with some sections having ropes to make it easier. As I slowly made my way down, I now understood why the lady at the headquarters advised me to take the sealed road so as to the stepper part on the descent. Ascending it would take the wind out of anyone. There were carved steps and some parts had wooden slabs to keep anyone from slipping all the way down. Nothing treacherous but definitely difficult. I finally reached the Main Trail that led to the camp grounds and eventually to the park headquarters. All in all, it took me less than two hours to do the entire loop. 1. You can take a van and asked to be let-off at the turn-off to Matang Family Park then walk to the park entrance from there. As for getting back to Kuching . . . I supposed you could wait by the side of the road. 2. There are many walking trails and it all depends on how much time you’ve got. The Summit Trail is a sealed road that goes all the way up to the summit. Yes, it it is sealed but it doesn’t mean you can take a vehicle. Walk. 3. There are cottages, chalets, and dorms if you wanna sleep over. You gotta book through the Sarawak Forestry Department. There’s also a canteen. 4. 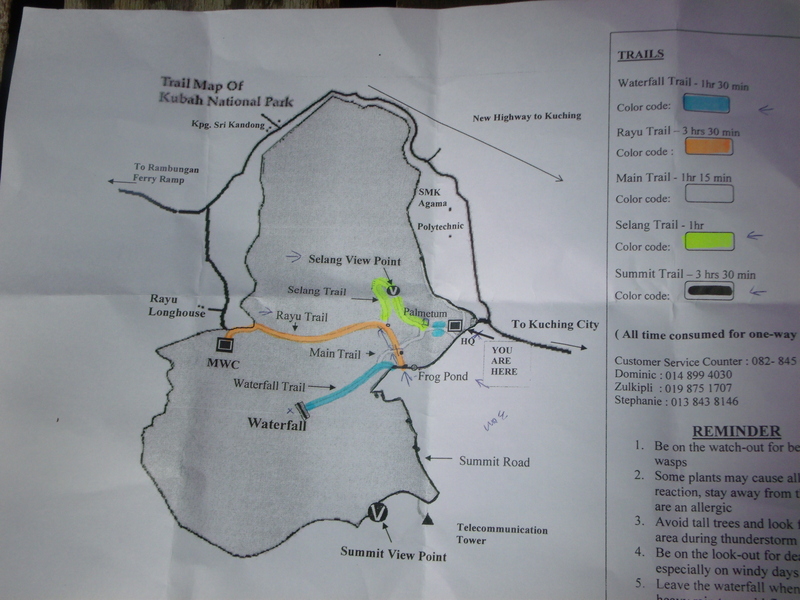 There’s a simple hand-drawn map which is easy to follow and includes the hiking time. 5. The lady manning the little office at the start of the Summit Trail is very very friendly and helpful.